Caroline Wozniacki beat Andrea Petkovic in straight sets to reach the semi-finals of the Aegon International in Eastbourne for the third year in a row. In a topsy-turvy first set, it took until the seventh game of the match for either player to hold when the Dane moved 4-3 ahead. An engaging set looked destined to go to a tiebreak until Wozniacki worked her way into the Petkovic serve in the 12th game, where she broke to take it 7-5. The second set was a stroll for Wozniacki, the 2009 Eastbourne champion, as she raced into a 5-0 advantage as the German started to wilt. A sympathetic crowd let out a loud cheer as Petkovic got on the board but it failed to spark a resurgence as her opponent clinically closed out the win in the following game, coming through in an hour and a half. 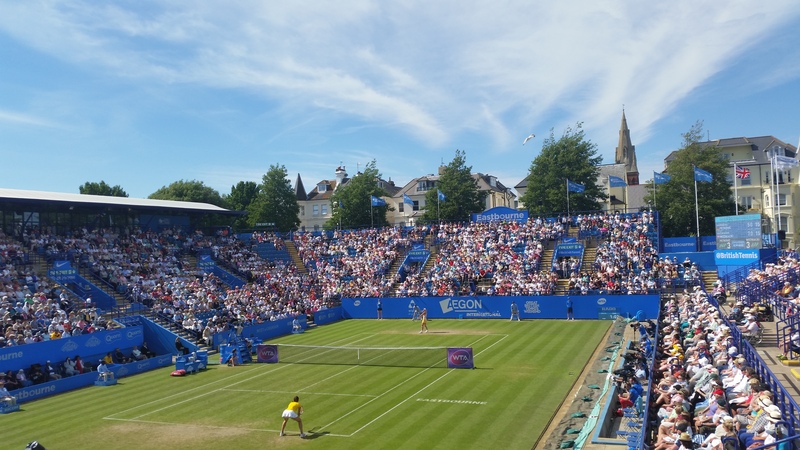 Johanna Konta’s dream run at Devonshire Park came to a frustrating end in a three-set defeat to Belinda Bencic, to the disappointment of a hopeful home crowd. The plucky Brit was looking to make her first WTA semi-final in what has been a tremendous week for the world number 146, but it was Bencic who prevailed to build on what has already been a superb month. As has been the theme with all her matches throughout the week, Konta started strongly, and surged through the opening set, taking it 6-2 in only 36 minutes. However, she was quickly stopped in her tracks as Bencic stormed back in the second, breaking three times to secure an ignominious bagel and force the contest into a decider. The long week appeared to take its toll on Konta as the match wore on, and despite her best efforts, she soon found herself trailing and was unable to get back on level terms as the 18-year-old Swiss maintained her advantage, wrapping up a 2-6 6-0 6-3 win in around two hours to book a semi-final match with Wozniacki. An Eastbourne resident, Konta also thanked the fans who rooted for her in a week which saw her beat three players ranked over 100 places above her. “I have had a very blessed week – to be able to play in front of such a loud and supportive crowd. It’s humbling and it’s a pleasure. “You know, I enjoyed every single match I went out there to play, and I’m just very proud of my effort this week and my ability to deal with whatever situation was presented to me on court,” she said. Agnieszka Radwańska continued her fine form on the grass with a 6-2 6-2 win over Bulgaria’s Tsvetana Pironkova in the first match of the day. The Pole, who is now into her third semi-final of the season, was rock solid on serve and broke her opponent four times to seal victory in just one hour and six minutes, without having to face a single break point. The former Wimbledon finalist looks to be hitting her stride at just the right time with the grass slam now less than a week away. Her crafty, skillful game has so far deserted her this year, but the easiness of her quarter-final win as well as the triumph over Karolina Pliskova in round three, bodes well for Radwańska. She will face Sloane Stephens in the last four after the American received a walkover when lucky loser, Daria Gavrilova, withdrew citing an abdominal injury. Stephens and Radwanska will be first to take to the court on Friday at around 1.00pm local time. The latter has won all of their previous three encounters – all of which were on hard courts – but the two have not played each other since August 2013. The American has had the benefit of a day off due to Gavrilova’s withdrawal but Radwanska will also be fairly well rested after a comfortable win on Thursday. Stephens is in search of her first WTA title while Radwanska is looking for her second grass tournament victory in Eastbourne. Following on from that match will be Wozniacki against Bencic. They have split their previous two matches but they have never met on the grass before. Bencic won their most recent bout in Indian Wells earlier this year while Wozniacki delivered a double bagel to her opponent in Istanbul last season. The Dane won Kuala Lumpur back in March but is without a title since while Bencic is looking to make her second grass court final of the year after finishing runner-up to Camila Giorgi in s’Hertogenbosch earlier this month. Ekaterina Makarova/Elena Vesnina and Yung-jan Chan/Jie Zheng reached the semi-finals of the doubles at the Aegon International after wins over Cara Black/Lisa Raymond and Julia Goerges/Lucie Hradecka respectively. Both last four contests will be played on Centre Court on Friday – sandwiching the two singles matches. Martina Hingis/Sania Mirza will take on Caroline Garcia/Katarina Srebotnik in the first match, with Makarova/Vesnina against Chan/Zheng set to conclude the day’s action.